"We estimate that by using Iron Speed Designer, we saved at least six months of development time, which translates to a savings of approximately $30,000"
- Mohannad Amr, IT Manager of STME Ltd. The Customer Support Activity Database (CSAD) was developed for System Technologies in the Middle East. System Technologies in the Middle East is an IT organization that provides onsite support for more than 400 direct and indirect customers in over 20 countries. The company employs approximately 200 people; 70 are engineers who deal specifically with backup solutions, disaster recovery, and business continuity solutions. They have immense lists of hardware and software products and parts from which they tailor their solutions to best fit their customer environment and requirements. The Support Activities report displays monthly usage by engineer. CSAD covers the operational processes, which include managing new installations, handling fault cases, and performing preventive maintenance. The application helps the company's support engineers to maintain records of their onsite work. The application tracks cases by individual engineer assignment. 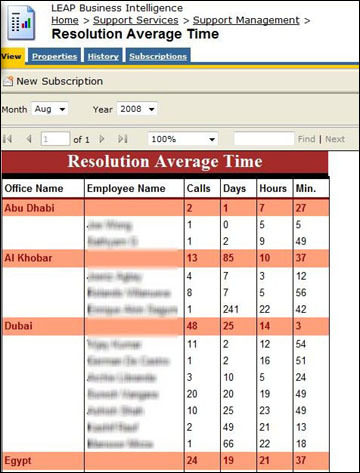 CSAD can also track remote support work or training periods. Support managers can track the time of their staff, assess staff training needs, and be informed about the status of each customer. The application helps senior management evaluate the performance of individual teams, the profitability of the relationship with each customer or vendor, the profitability per technology line, geographical area, etc. 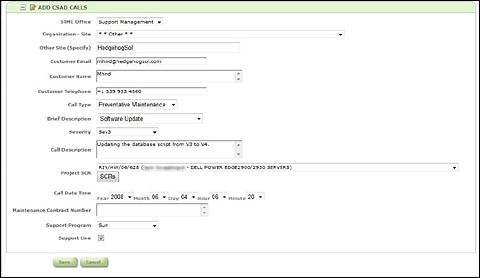 The entry screen when creating a new support call. 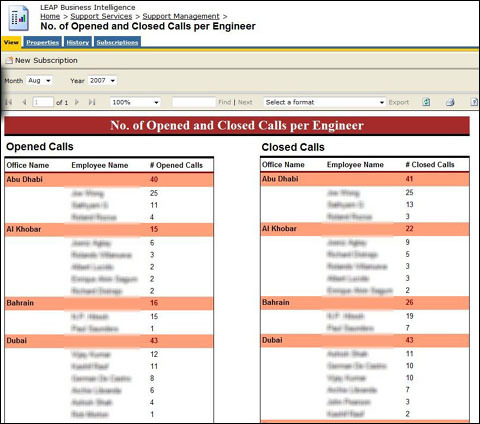 When opening a call, the system shows a list of predefined call descriptions depending on the call type. 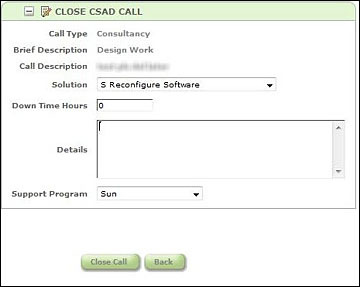 When closing the call, the system shows a list of possible solutions depending on the pre-selected call type. Call closure screen. 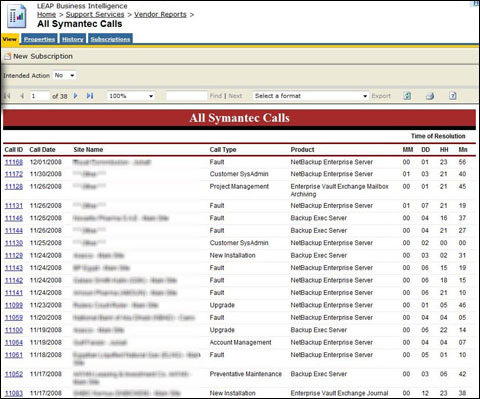 The solution menu is filtered based on the selected call type when the call was opened. The call screen displays the history of each call. As engineers perform actions against open calls, they specify in the system the cause of the problem. They do this by using four nested menus for hardware and another four nested menus for software. Because there are many types of calls (i.e. fault calls, installation calls, preventive maintenance calls, etc. 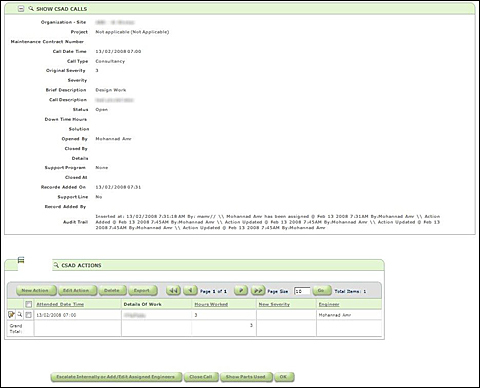 ), each call is tagged to the related project number, sales contract record (SCR), or maintenance contract number. The nature of the tag depends on the type of call and the relationship with the specific customer. This was an important requirement, so that the customer can report on the time and cost spent against each one of these parameters. Site Work Details report where engineers record their call history. The security part of the system was of considerable importance to System Technologies in the Middle East. Due to the size and nature of the customer's business model, we had to deal with a long list of business rules, system roles, and several groups of nested menus. Proper internal and external escalation procedures. Accurate tracking of the lifecycle of calls. Detecting trends in the fault of parts and products. Sharing knowledge among support team members. Analysis of time spent on each site, project, maintenance contract, sales contract, etc. Analysis of time spent per product, part, product family, manufacturer and/or vendor. Analysis of time spent by each engineer, office, project team, etc. 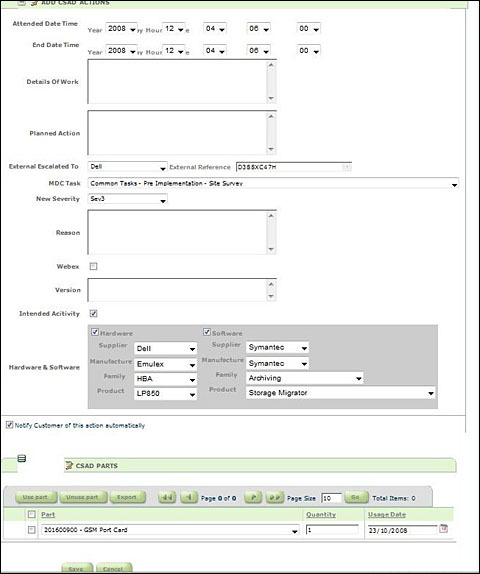 Ability to report on workload per customer, project, and maintenance contract. This will enable the company to negotiate better contracts in the future. All of the information in CSAD is backed up with a comprehensive reporting system. 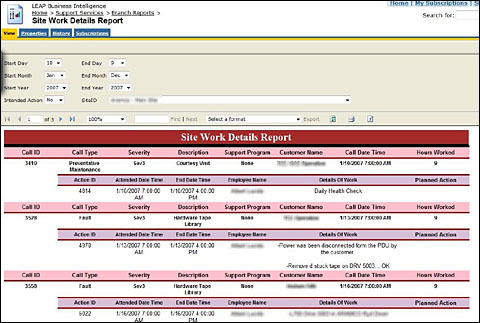 Reports of CSAD are categorized into four categories: Branch Reports, Support Management, Time-Sheet Planning and Vendor Reports. The CSAD application accesses one MS SQL 2005 database. The application uses more than 40 tables, 10 views, and 20 stored procedures — and this does not include the procedures Iron Speed Designer automatically generates. The largest database table is the "Actions" table. This table records the actions performed by the engineers on each support case. There are more than 80 Web pages in the application. We estimate that the support team of 70 engineers uses CSAD on a daily basis, while 20 support managers and five senior management staff use the application as needed. At a minimum, we have 15,000 new records in the database each month. Report listing in Timesheet planning category. It took two full-time programmers and one system/database analyst eight weeks to develop, implement and stabilize the application. However, the major part of the work was accomplished in just about four weeks. Iron Speed Designer took care of the routine development work, and left me and my team free to focus on customizing the application and meeting the customer's special business requirements. We had to write a reasonable amount of customized code, including sophisticated grid and dropdown menu filtering, email notifications, and changing the default logic of some buttons (i.e., sending users to different Edit pages depending on conditions and their system roles). That said, the built-in Code Customization Wizard was of a great help, both when we used it by itself or when we used it as a guide to develop more complex functionality. We used MS SQL Server Reporting Services for reporting purposes and integrated that into the application. Report listing in Support Management Category. This section appears in the "New Action" screenshot shown below. New actions screen. Actions are the work done under each call. 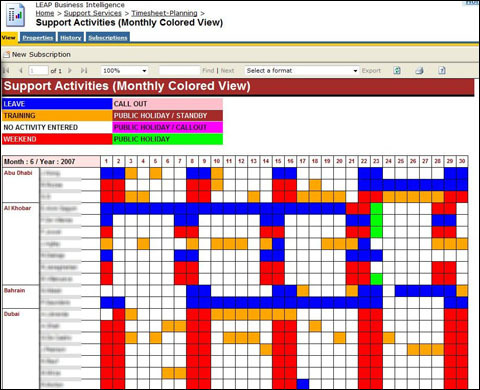 It shows two groups of interlinked menus (four menus each). We used the standard Andes design theme in Iron Speed Designer. We estimate that by using Iron Speed Designer, we saved at least six months of development time, which translates to a savings of approximately $30,000. If we had not used iron Speed Designer, we estimate the development of the Customer Support Activity Database application would have taken six months. Using Iron Speed Designer, the CSAD application was completed in two months. We would have done CSAD application without Iron Speed Designer, but it would have cost much more. Iron Speed designer allowed us to be more cost-effective and competitive in the market. There are very ambitious plans to integrate this application into a specialized project management module, customer environment profiler and an enterprise accounting system. The requirements of these future phases are being developed. There is no way any of these plans could be done without the help of Iron Speed Designer, simply because the cost wouldn't be feasible. The new modules will allow new groups of users access to the new integrated system. The types of users will include finance staff, project managers and back office staff. This will increase the number of potential users to more than 200. Mohannad Amr has been in the software development industry for 14 years. He has a BCs in Computational Physics from Jordan, and an MBA in IT Management from Leicester University — UK. Mohannad has worked in several roles, including as group IT Manager of an IT solution integrator with 16 offices in the EMEA region. He is PMP, MCSD, MCP and MSF certified. Mohannad has been using Iron Speed Designer since early 2005 and has managed at least ten applications and several enterprise level solutions using Iron Speed Designer. In addition to business solution architecture and project management, Mohannad has a special interest in modeling business processes and workflow systems.